Inspired by reading over Noelle’s entry about her delicious-looking salsa, I decided tonight to utilize the tomato-y bounty given forth to me by Josh’s beautiful heirloom variety tomato plants growing out on our deck. But instead of a salsa, a fresh tomato sauce that I could mix in with the whole wheat linguine I got on sale at Busch’s yesterday, and serve it with the boneless skinless chicken breast I had thawing in the oven. AND it would be a light healthy dish. I love it when a plan comes together. The smug foodie in me (I am writing this on a Mac after all) was also pretty proud of the fact that just about all the produce in this dish was locally grown, too. The tomatoes, thyme, parsley and basil came from our own deck garden (we live on the third floor of an apartment building, but are lucky enough to have a big long deck which we line with various pots containing leafy and delicious products). And the peppers, garlic and onion came from our farm share. Delicious. 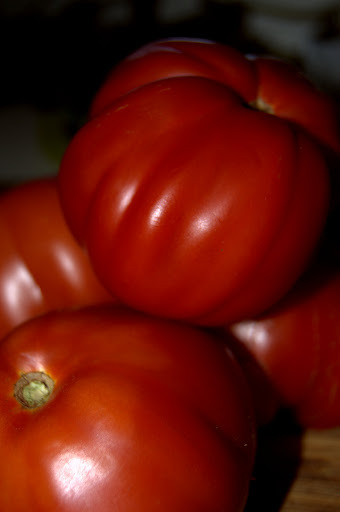 Place tomatoes, thyme, parsley, basil, onion, garlic, peppers and about a tablespoon of olive oil in a blender and blend into a chunky purée. Season with salt and pepper to taste. Pour tomato sauce in with the hot linguine and mix thoroughly. Plate and top with chicken. This whole meal takes generally about the time it takes to cook the pasta. 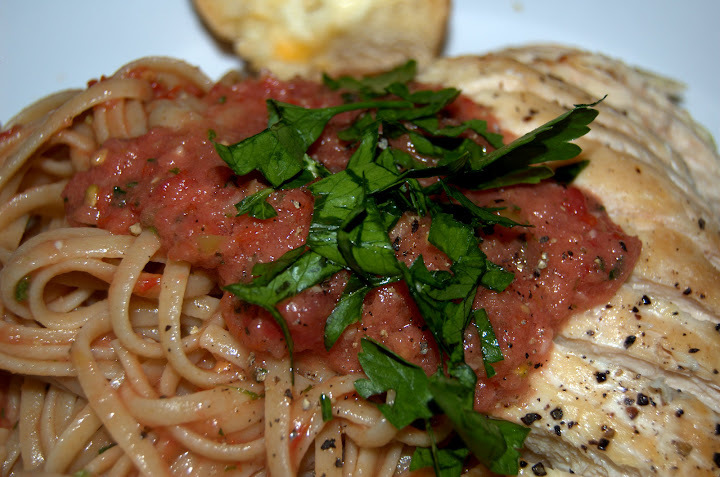 The sauce takes almost no time at all and while getting the pasta ready, I broiled the chicken. It’s very fast, very light, very fresh and delicious. And after this meal, you won’t feel guilty about the Edy’s Double Fudge Brownie ice cream you bought for dessert. 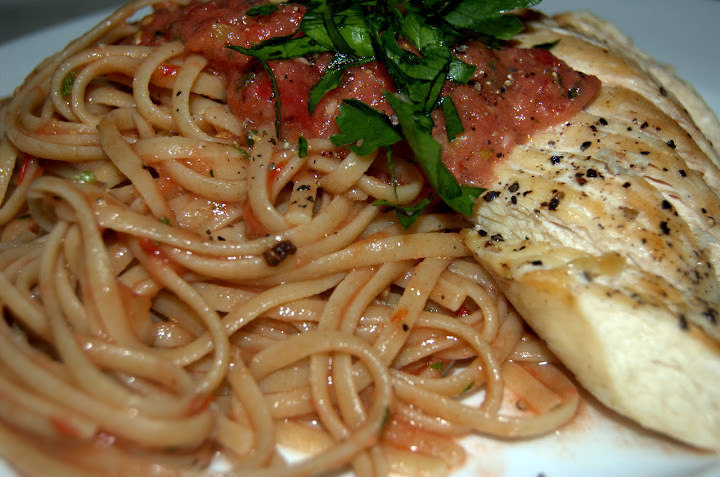 This entry was posted in General Musings and tagged chicken, healthy, local, pasta on August 24, 2009 by Lauren.